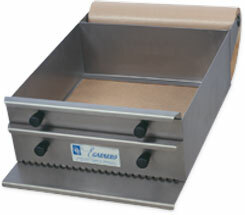 Suitable for spreading uniformly different doughs through kraft paper. Built in stainless steel (AISI 304). With adjustable sliding to egalize the high step. Half-door to lock the exit of the product. For trays of width 40 cm.